The Old Graveyard is an outdoor area of the Haunted Towers in Luigi's Mansion: Dark Moon. The Old Graveyard is accessed by taking the elevator inside of the Tree Root. When Luigi first enters the Old Graveyard, he is dropped by a large statue of a crow. There are many dead trees in the area with vines and other plants growing around them. The Old Graveyard has many crows that sit atop the gravestones and the entrance to the Crypt. The entrance to the Crypt has several topiary of Boos. To the right of the entrance, there is a coffin with four candles around it and another coffin that acts as an elevator. The north door takes Luigi to the Crypt and the coffin elevator takes him to the Sewer. 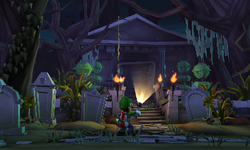 During Graveyard Shift, Luigi must travel through the Old Graveyard to reach the Crypt. After rescuing the Toad assistant from the Crypt, Luigi is attacked by The Three Sisters. After defeating the Three Sisters, Luigi must use Toad to weigh down the coffin that takes them to the Sewer. Blowing out the candles by the coffin during this mission causes a Gold Greenie to appear. Starting on Graveyard Shift and most missions after, when Luigi first enters the area, he should look up to see an Emerald hanging from a vine. Simply using the vacuum on the vine causes the gemstone to fall and allows Luigi to add it to his collection. In missions after Graveyard Shift, there is nothing of interest in the Old Graveyard should Luigi return there, although he can now travel to the Sewer with a bucket of water that appears there. This page was last edited on May 25, 2018, at 00:42.